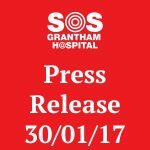 You can find out how to help the SOS Grantham Hospital campaign here. 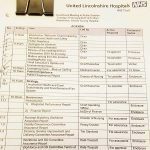 Please join our call to stop United Lincolnshire Hospital Trust (ULHT) downgrading Grantham Hospital A&E and sign our petition today. A printable copy of the Petition Form may also be downloaded here. 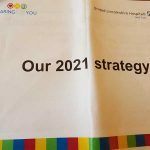 The petition will continue to run until a Public Announcement of the Lincolnshire Sustainability and Transformation Plan is made. 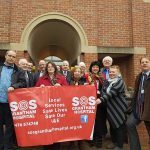 SOS Grantham Hospital will take the petition to 10 Downing Street with the support of Nick Boles MP for Grantham & Stamford Constituency. Details to follow. Update October 2016: Thank you so much to the 32,000 UK residents and 13,980 overseas residents who have signed our petition to date. Thank you to all of the people who have worked so hard to gather petitions especially our super petitioner Jayne Dawson of Ancaster who has single handedly obtained 10,000 signatures since the night time closure. You can make a donation securely via PayPal using one of the Donate buttons on the site. Alternatively you may send a cheque made out to SOS Grantham Hospital to the address at the bottom of each page. We hold various fundraising events and meetings, details of which can be found on our New & Events page.